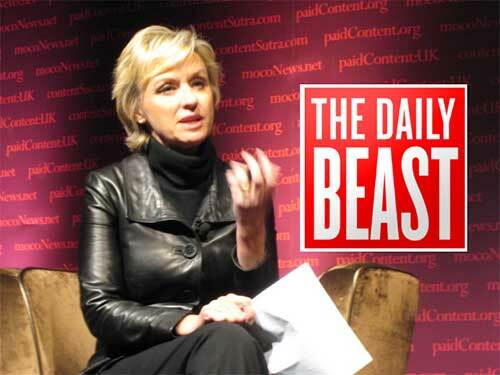 Tina Brown, one of the best-known journalists in the English-speaking world, announced last week that she was resigning as chief editor of The Daily Beast. Right from its inception, the project she founded in 2008 to promote quality journalism on the Internet has battled with financial problems. This entry was posted in Uncategorized and tagged quality journalism, The Daily Beast, Tina Brown. Bookmark the permalink. An artistic experiment such as The Daily Beast does not comply with the realities of commerce. There is no rule that says media must be paid by the consumer? . Internet sites like “Daily Beast” should not consider themselves “print” journalism, because they are not a physical product delivered to your door, to be read and re-read in reception rooms, MD offices, old world libraries, or gifted. The consumer relates to the product/service more like TV and Radio, where content is largely supported through advertising at a cost/price per pair of eyeballs of set demographics. BBC is an outlier is being financed through subscription. Doubtful pay walls for all but the most premium websites will survive. There are too many ways to circumvent many/most. Isn’t the problem the reluctance of the advertiser to pay a sufficient rate per viewer? How might this change? I added the word “print” only because that is what The Times was thinking about. The CBC produces quality journalism that is not financed by subscribers.